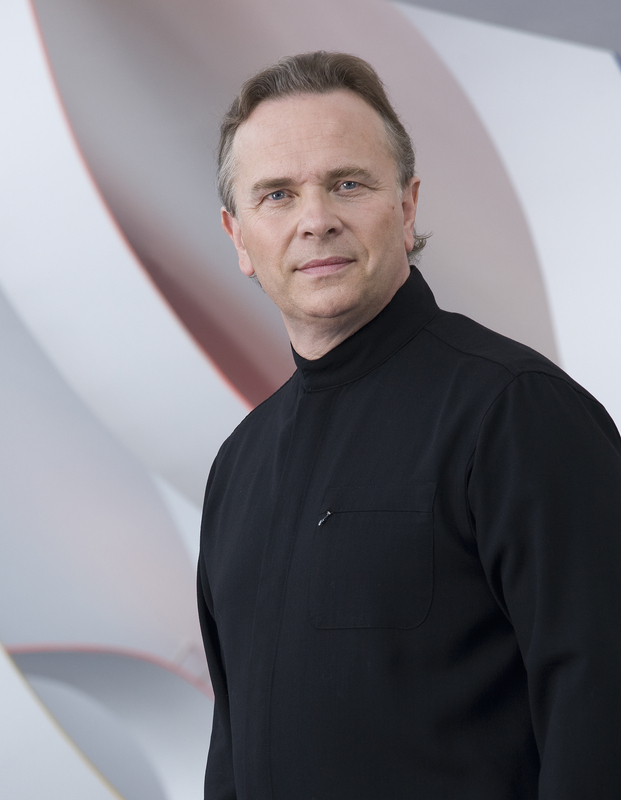 Sir Mark Elder has history with the renowned Russian composer, Dmitri Shostakovich. Perhaps it’s no great surprise then that the work of Shostakovich is the central feature of this season’s Thursday Series of concerts by the Hallé. What is perhaps unusual is the decision to eschew his famous symphonies, focusing instead on all six of Shostakovich’s less well known concertos. 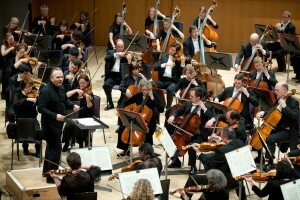 Sir Mark explains: “In my career as a conductor I have always concentrated on his symphonies. We thought it would be an interesting experiment for the public to be given a chance to hear how all six of these powerful, profound yet very different pieces fit into the output of this very protean composer, coming as they do from very different times in his life. Sir Mark is supremely qualified to judge such matters. Not only does he have a glittering musical CV longer than a double bass, he also saw Oistrakh play at that crucial Damascene moment at the Royal Festival Hall. 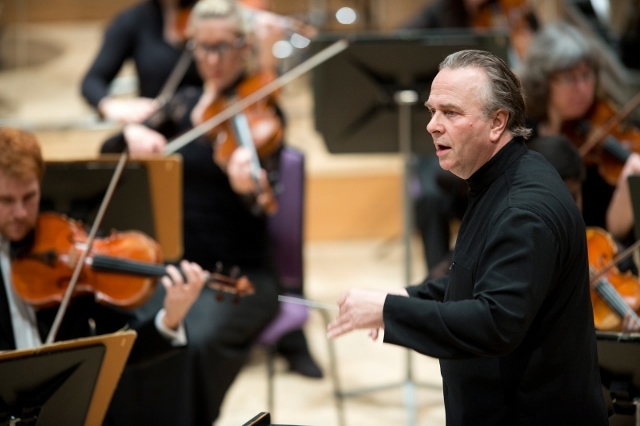 I’m no Saul but I can claim to have seen something of a miracle at Manchester’s Bridgewater Hall earlier this year when Sir Mark conducted the Hallé in its performance of Shostakovich’s Violin Concerto No. 2. Written in the spring of 1967 as an early 60th birthday present for its dedicatee and soloist Oistrakh, this was Shostakovich’s last concerto. However, given the fiendish complexity of the soloist’s part, it’s hard to believe that the pair were good friends. On the night of the concerto at the Bridgewater – sympathetically placed between a stunning performance of Fantasia on a Theme by Thomas Tallis and an inspiring rendition of Tchaikovsky’s Symphony No.6 Pathétique – this was expertly handled by the Sir Mark and the Hallé. Slowly, gently and without the audience ever quite realising what was happening, Shostakovich’s brilliance built a disquieting assault on harmony in all of its forms. Here, in the world’s first industrial city, the audience was treated to the notational heir to constructivism, the rightful partner to suprematism and the undeclared soundtrack to Zamyatin’s dystopian novel, We. The soloist entrusted with Oistrakh’s original part was the Norwegian violinist Henning Kraggerud whose performance reached positively Faustian levels of skill and intensity. And the appearance of such prodigious individual talents as soloists has been a marked feature of this series. But for many it is impossible to consider the work of Shostakovich without placing it in a historical and political context. Shostakovich is today routinely referred to as a Russian composer yet there was a time when the prefix to his name and profession was not national in character, but political. 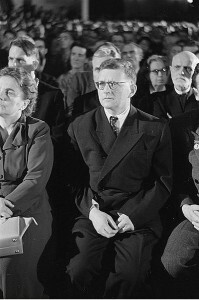 Dmitri Shostakovich was only 11-years-old when the Bolsheviks seized power in the October Revolution. His entire career was conducted in the baleful shadow of Soviet Communism. He would not be known as a Russian composer until the Red Banner above the Kremlin was hauled down for the final time in 1991. Prior to that Shostakovich was a Soviet composer, and a great one – but was he a good Soviet citizen? Sir Mark says: “We are all of us so very interested in what we have learnt about the Soviet Union since the fall of communism, that’s had a very powerful effect. But it’s perfectly possible to listen and appreciate the music of Shostakovich without knowing anything about his life. “That said, the denunciations had a profound effect upon him. Before the 1936 denunciation he was the golden boy, elegant and well dressed, witty and charming, very much the face of the new life, the new Soviet culture. The denunciation turned him in on himself and the music he then developed came from a desire to speak to his fellow men in a hidden, elliptical way. While opinion remains somewhat divided as to the extent of Shostakovich’s opposition to Soviet power, what is not in doubt is the fact that, at least twice in his life, Soviet power came very close to destroying him. Being a respected figure in the arts, and previously held in high regard by the authorities, was absolutely no protection from the arbitrary terror imposed by the Soviet leaders upon their own people. Consider the fate of the famous avant-garde theatre director Vsevolod Meyerhold who was arrested by the secret police in June of 1939. Meyerhold was imprisoned for more than a year during which he was horrifically tortured by his NKVD interrogators who forced him, like so many during the great purge, to confess to an absurd litany of imaginary crimes against the Soviet state. He was executed in February 1940. It is unclear as to whether or not at the time of his death he was aware of the fate of his wife, the actress Zinaida Raikh, who one week after Meyerhold’s arrest was murdered by the secret police in their Moscow flat. They gouged out her eyes. This was the world faced by Dmitri Shostakovich when he was first denounced in 1936, the year in which The Great Terror began. Criticism of him began to appear in the press. He and his works were denounced as formalist and soon friends and family, including his patron Marshal Tukhachevsky, began to be arrested and imprisoned or shot. In the face of such pressure it would be entirely human to expect Shostakovich to compromise his artistic integrity in any way he thought might mollify his oppressors. Yet what he did was to prove quite remarkable. In November 1937 he premiered his Fifth Symphony in Leningrad. It was, on the surface at least, a stylistically conservative piece, a move doubtless calculated to appear as an act of appeasement before the establishment. Yet, running through the work were strong currents of deep emotion, a fact that was not lost on audiences who themselves were living in terror of the midnight knock at the door from the secret police. Like Mikhail Bulgakov, Shostakovich never confronted the apex of Soviet hierarchy in his work. Instead he choose as his target the effects of its absolute grip on power – the claustrophobic nightmarish miasma which was the exhalation of the party’s organs and which clung to every nook and cranny of Soviet life. Hence the intensity, the juxtaposition of styles and the acute angles his compositions would sometimes display. Throughout Shostakovich’s career this was to become a recurring feature in his work. In effect, Shostakovich began to deploy the dark art of persuading an audience to suspend its disbelief in secret and he began to write and perform in Doublethink, a decade before celebrated author George Orwell gave this practice a formal name.